I got out of Midgar and took a metaphorical breath of fresh air. Finally! The open world lay before me and I was going to explore it. And explore it I have. Compared to the last time I posted I'm having so much more fun with Final Fantasy VII. I love the feel of an open world to explore in a JRPG. It's a different feeling from an open world game from the west like GTA, Assassin's Creed, or Skyrim. It's more abstracted and not as detailed, but it has it's unique charm. I've been having fun wandering the overworld map and battling random enemies. I've actually started hunting for enemy skills to acquire, which is something I don't typically do in Final Fantasy games. Blue magic typically seems boring to me, but I'm interested since it's contained in a Materia this time. I haven't really been grinding so much as exploring more than I strictly need to. I just want to take in the world and poke at it's boundaries. I also feel like this gives the story a better pace. No longer am I constantly getting exposition info dumps from the characters. The story is growing more organically and the overworld portions break it up nicely. The most fun I've had so far is really getting a chance to play with the battle/materia system. The battle system is a fairly standard ATB system from other Final Fantasy games. Three characters are in your party and they each get to take an action when their ATB meter fills up. 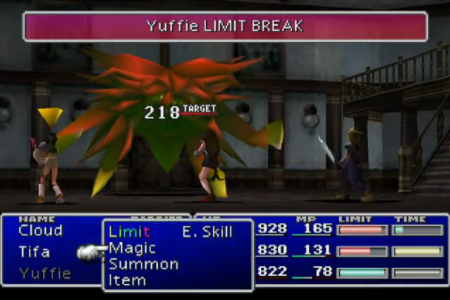 They also have Limit Breaks, which are super powerful abilities that charge up each time the character takes damage. 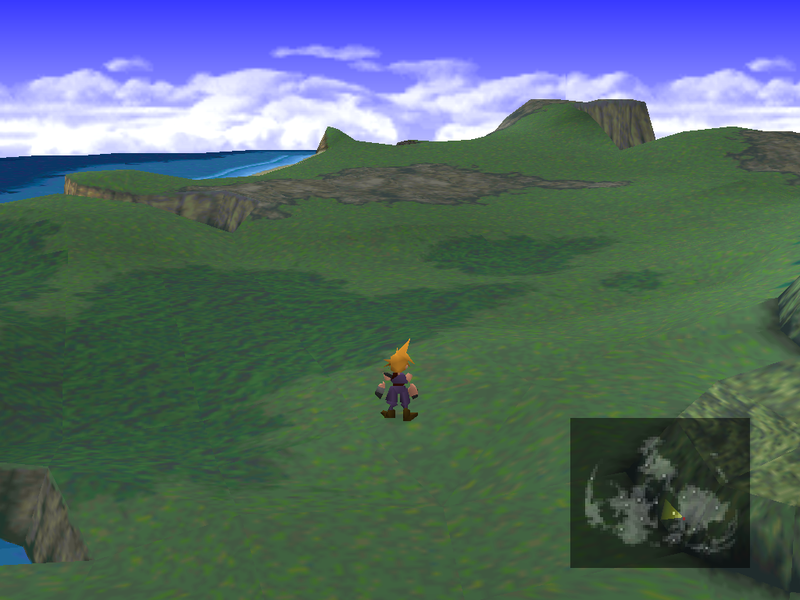 In the open world, with random battles, there's some room to experiment and the Materia system starts to shine. Materia is the unique aspect of FFVII. Attack, Defend, and Item are always available to each character. To use any other ability or Magic that character needs to equip Materia. Each weapon and piece of armor comes with a number of slots that will hold Materia for that character. Materia comes in the form of spheres that each have a unique ability. For example, each spell type is its own Materia. If you equip Lightning Materia on Cloud he will be able to cast the magic spell Bolt. If that Materia goes through enough battles it will gain experience and level up. At that point Cloud will be able to cast Bolt and also Bolt2, a powered up version of the first spell. The interesting part of Materia is that it's independent of characters. 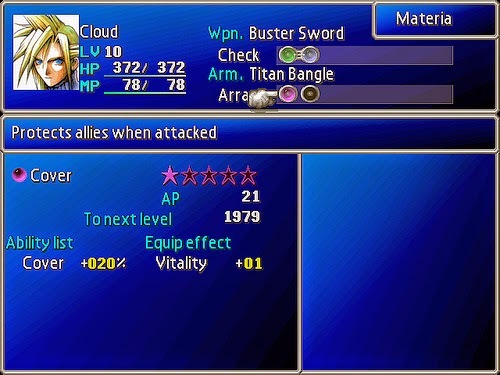 I can level up a set of Materia on Cloud and then move it all to Tifa and she will have the exact same skillset and abilities that he used to have. It makes for a lot of customization options. It also encourages playing around with different set ups since you don't have to permanently commit Materia to one person. I've been switching Materia and characters a lot up to this point. I'm not sure who my core team is going to be yet. Cloud is obvious. I'm leaning toward Tifa as my second. In past playthroughs I've used Barret as my third, but he's not as appealing to me this time around. Maybe I'll try one of the optional characters in that spot because I never have before. Overall my opinion is much improved over my first post. I don't know when I'll chime in next, but I'll definitely have more thoughts on FFVII for you later. I think the materia system along with limit breaks were the best thing going for JRPGs at the time. Possibly still, but I haven't played a FF game since IX. I probably should, but spending the time on all those that I missed doesn't sound very appealing at this point in time. Already too much to do. It's been a lot of fun to go back and re-experience this game. I can already tell this isn't going to be one that I'll replay after this. It's good, but it's dated. I'm really excited to keep working through the series. I have high hopes for FFIX and FFX.